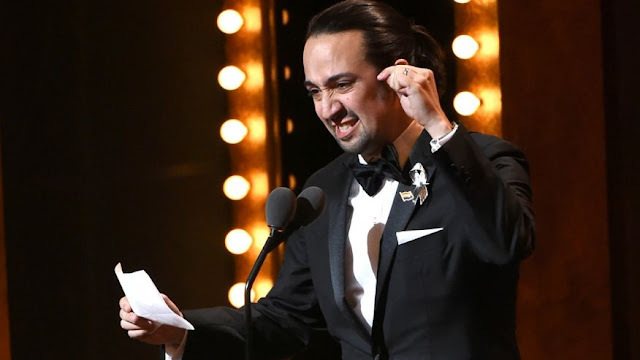 NEW YORK – "Hamilton," the hip-hop stage biography of Alexander Hamilton, won the 2016 Tony Award for best new musical, capping an emotional night in which many in the Broadway community rallied to embrace the LGBT community after a shooting at a gay Florida nightclub. Lin-Manuel Miranda's hip-hop-flavored biography about the first U.S. treasury secretary won 11 Tonys, just short of breaking the 12-Tony record held by "The Producers." Jeffrey Seller, producer of "Hamilton," quoted the show's lyrics when accepting the award. "Look around, look around. How lucky we are to be alive right now," he said. "Hamilton" went into the night with 16 nominations and, in addition to taking the musical award, won best score, best book, direction, orchestration, choreography and best featured actor and actress statuettes for Renee Elise Goldsberry and Daveed Diggs. Leslie Odom Jr., who plays Aaron Burr, won best actor and thanks Miranda for "a new vision of what's possible." He thanked his wife, actress Nicolette Robinson and his parents. The show earlier won awards for costume and lighting but lost scenic design to "She Loves Me," meaning "Hamilton" couldn't break the 12-statuette record haul by "The Producers." Still, few shows get introduced by a sitting president, as Barack and Michelle Obama did for the performance by the show's cast. The awards show unspooled with a heavy heart a night after a gunman killed 50 people at a gay Florida nightclub, prompting a Broadway tribute to the victims at the top of the show and a smattering of references to tolerance throughout it. Host James Corden, his back to the audience, spoke to viewers when he dedicated the night to celebrating the diversity of Broadway. "Hate will never win. Together we have to make sure of that. Tonight's show stands as a symbol and a celebration of that principle," he said. But for much of the telecast, the mood was light and typical of an awards show. Miranda, the star and creator of "Hamilton," won for best score and book, and read from onstage a sonnet, referencing tragedy and urging "love and love and love...."
Thomas Kail won the Tony for directing "Hamilton." He thanked Miranda, a frequent collaborator, and celebrated the diversity of Broadway this season. "Let's continue to tell stories," he said. English actress Cynthia Erivo won the Tony for best actress for her Broadway debut in "The Color Purple." She thanked her cast for "making me a stronger woman on that stage." Her show, which failed to beat "Jersey Boys" for the best musical Tony Award in 2006, won the best musical revival award in 2016. Jayne Houdyshell, a mainstay of the New York stage, won her first Tony Award at 62 for playing a gossipy, gently needling mom in "The Humans." Her stage husband, Reed Birney, won best featured actor in a play. An actor for almost 42 years, he acknowledged that 35 of them were "pretty bad." He thanked the theater community for keeping him going. The play, about a fractious family's get-together, won the best play statuette and playwright Stephen Karam dedicated his award to all the struggling writers. "Keep the faith," he said. In response to the shooting Sunday that left at least 50 people dead in a crowded nightclub in Orlando, Florida, "Hamilton" dropped its use of muskets in its performance. Many stars also wore a silver ribbon to show solidarity. "My heart is saddened by it," Seller said on the red carpet before the show. "The celebration tonight is tempered by it." The shooting was close to home for Christopher Fitzgerald, who was nominated for his role in "Waitress" and went to school in Orlando. "I'm heartbroken. I think everybody is feeling it, so we are at least all coming together to celebrate and not live in fear," he said on the carpet. Jessica Lange won her first Tony for playing a drug-addled mother in the revival of the monumental "Long Day's Journey Into Night." The two-time Academy Award winner said: "This is a dream come true and it fills me with such happiness, even on such a sad day as this." Frank Langella won his fourth Tony for playing a man who has begun his slide down the slippery slope of dementia in "The Father." He almost teared up when he mentioned his brother's struggle with dementia. He also had a message for the people of Orlando: "We will be with you every step of the way." Dutch visionary Ivo Van Hove won his first Tony for directing an imaginative revival of Arthur Miller's "A View from the Bridge." Under his helm, the barefoot cast warily circled one another under bright lights in a set that resembled a boxing ring. The show was also named best play revival. The show opened with the cast of "Hamilton" performing their opening number with the lyrics altered to have them all wondering why Corden — "chatting with Hollywood phonies" — had earned the honor of hosting the show. The "The Late Late Show" host had some quips for the theater-loving audience: "This is like the Super Bowl for people who don't know what the Super Bowl is," he said at one point. At another: "Think of tonight as the Oscars, but with diversity," and made a dig at Donald Trump for wanting to build a wall around the theater. He later flirted with Oprah Winfrey. Donald Trump was a frequent target. Nathan Lane made a crack about Trump University and Emilio Estefan insisted that his all-Latin cast for "On Your Feet!" were all in the U.S. legally. Corden at one point suggested there were so many diverse performers on the show that the Republican candidate would want to put a wall around the theater. There was also a joke about Trump starring in "The Book of Moron." To be fair, Glenn Close mocked Hillary Clinton in the fictional show "A Clinton Line." "Hamilton" and the 38 new productions this season helped Broadway's attendance figures hit a record high, up 1.6 percent to 13.3 million ticket buyers. The season also was rich in diversity among actors: Fourteen of the 40 Tony nominees for acting in plays and musicals — or 35 percent — were actors of color.